UdB In San Diego Youth Ask For Help Building “Dual & Contending Power” In Our Communities For 2015! Base Ernesto Che Guevara (BECG), the Base of Unión del Barrio in San Diego that focuses on youth oriented work, has been very busy these last few months. Escuelita Aztlán San Diego 2015, Photo by RC. 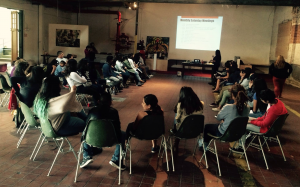 Since the end of November 2014, we have organized three sessions of Escuelita Aztlán (EAZ), an independent Saturday School organized by educators and youth organizers of Unión del Barrio in San Diego. EAZ serves two goals: 1) to develop more cultural and political conciencia among young people in our communities, and 2) to help build our long-term vision of an independent “raza liberation school”. EAZ has become a dual and contending educational resource. We hope to see a day soon when our community youth begin to prioritize EAZ over traditional classes they are forced to take on a daily basis. Most of those traditional classes usually offer a version of our history and culture from a negative perspective, if it is brought up at all. The last three sessions of EAZ have had an average of 35 participants each, and focused on the themes of the history of EAZ, the Mexican Revolution, and the meaning of Human Rights in our communities. On December 2nd, BECG hosted the monthly Unión del Barrio Political Education discussion at the Centro Aztlán Marco Anguiano (CAMA) and focused on “Solidarity With Ayotzinapa” and the terrible attack against the young compas normalistas of Guerrero. With 15 people in attendance, we began with a discussion on the difference between education as an instrument of repression, and education as a liberatory process. We then watched a short video about the recent attacks in Guerrero, and ended the night with a very rich discussion about what this all means for us and the struggle in general. Currently BECG continues to make plans for our ongoing EAZ work, and we are in the beginning stages of organizing the 11th Annual Marcha de Zapata, which is tentatively set for April 11, 2015. Equally as important for us as our ongoing community organizing is building a better understanding of what our future holds and why we need to do more. At a recent Political Education discussion we all agreed that we need to convince people around us that “what comes next” after Ayotzinapa, mass deportations, Mike Brown, Eric Garner, criminal violence against Palestine, environmental crisis, etc. will need something more concrete than more protests and more #hashtags#. In BECG we all agree that the kinds of crisis and violence that we see all around us these days requires more organization and more independent community based power like EAZ. We all agreed that we need more help. So join us and help us build “dual and contending power” in our communities! This world is too messed up for us to survive while too many youth still don’t join an organization and prefer to continue to “do their own thing”. ¡Hasta La Victoria – Siempre! This entry was posted in 2014, 2014 Events, Barrio Youth News & Events, K-12 News & Events, Local Community News & Events, San Diego News & Events. Bookmark the permalink. ← ¡Viva Cuba Libre y Socialista! Unión del Barrio Statement About Recent Changes In U.S. Policy Towards Cuba. Declaración Sobre Relaciones Cuba – Estados Unidos.